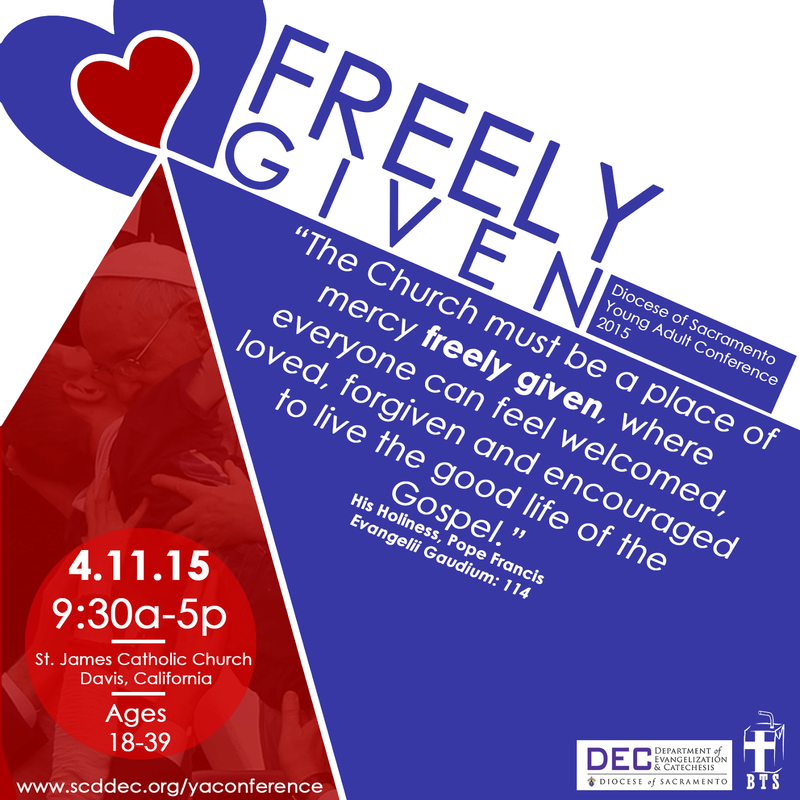 You still have a chance to register for the Diocese of Sacramento Young Adult Conference. Be The Straw will be there. Join us! There's also going to be some pretty awesome speakers and some beautiful things happening. "I'm broke" - It's super cheap. Only $20! "I can't pay right now" - You can register at the door, that means you have time to go recycle some cans, or sell some of your old textbooks. "I'm too busy" - Jesus wants to spend some time with you, oh and, if you're thinking about maximizing your time, there's a Sunday Mass you can attend at St. James right now. "I'm still not sure..." - you can register at the door, so when you wake up on Saturday morning, just listen to your heart. Any other excuse... - Did I mention BTS will be there, plus some awesome speakers, plus Jesus! The Sacramento Diocese Young Adult Conference is an opportunity for young adults (ages 18-39) to learn, worship, and gather as a community. This year's conference theme was chosen from Pope Francis's apostolic exhortation "Evangelii Gaudium". The Pope reminds us that the Church is a place of mercy, and a mercy that is given freely and in abundance. Moved and impulsed by Christ's great love and mercy for us, we are called as the body of Christ to serve and love all of our brothers and sisters, so that they may also feel at home as part of our Church family. Talk: "Joy and Spirit Filled Evangelizers"